Our Banbury workshop is where we mostly concentrate on producing the glass that we have worked on by processing it. Polishing, laminating, adding colour, leaded designs, UV Bonding and by drilling holes or by cutting shapes. Using sheets of plate glass to enclose a balcony, terrace or staircase, whether it is for commercial or domestic use will provide a beautiful and contemporary addition to a property. Glass will maximize the available light and view creating a modern and light appearance to its surroundings. The glass panels can appear almost seamless or may be supported by stainless steel poles. The process of UV Bonding uses a specialist clear resin adhesive cured by ultra violet (UV) light. The finished bond is crystal clear and is particularly suitable for items with design features in mind as the bonding is invisible and takes away the need for visible fixings. For an enhanced clarity and ultra clean lines we use Low Iron glass, this almost colourless glass virtually eliminates the green hue inherent in standard clear glass. This is especially noticeable on exposed, polished edges and thicker glass such as tabletops. Using glass as a surface in a kitchen or bathroom as an alternative to tiles will look stunning because glass will reflect light back into the room and with a smooth surface it will be easy to clean. The glass used is Toughened so it is safe to go behind the hob. Painted glass is becoming widely used in kitchens and bathrooms, as a stunning alternative to ceramic tiles. Glass is sprayed in just about any colour you would like to match your colour scheme. Templates are taken of the area and cut outs will be made for sockets, light switches etc. The idea is to have only the minimum of joins in the glass so that the finished look is of a smooth, clean surface and it is adhered to the walls using silicone. The glass can be sprayed in just about any colour to match the colour scheme of the room. Ultra clear glass that has a low iron content should be used, it is almost colourless and virtually eliminates the green tint inherent in standard clear glass. Most noticeable in thicker glass or on the exposed and polished edges. If low iron glass is not used it is likely that the green tint in the glass will alter the colour of the paint applied to the back. The installation of a conventional tiled kitchen splashback can be quite time consuming, depending on the size of your kitchen. Glass splashbacks are sometimes considered to be more costly than tiles but the installation time is far shorter and the end result is, in our opinion STUNNING! Traditional Genuine Leaded Lights where the lead is used between the individual pieces of glass to make a design or picture are repaired and restored to their original condition in our workshop using restoration glass and traditional skills. A bespoke design or picture is produced onto a single pane of glass using stick on lead and coloured film or to give another dimension we can include bevelled or brilliant cut designs. The glass pane can be made into a double glazed unit, usually for a feature window or door panel. Pigmented laminated glass uses a coloured resin layer as the laminate. A large range of colours can be used in opaque or transparent form. By having the ability to laminate all types of glass available to the industry and not just a select few, resin laminating can provide the laminator with the flexibility to provide customers and architects with the products they need to be creative. Of course this process of laminating can also be carried out as clear glass without any colour pigment added to the resin. 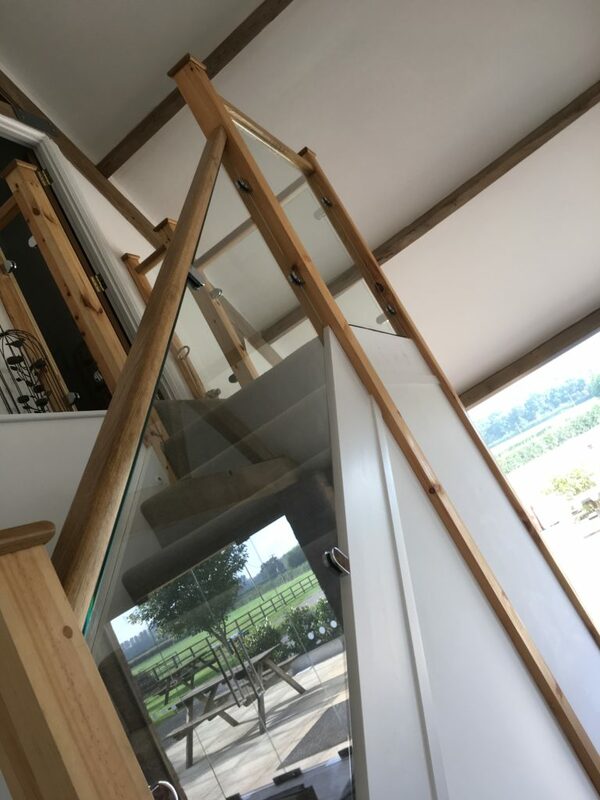 We are specialising in smaller internal glass projects where pigmented laminated glass is manufactured by us to a maximum glass size of 3 meters x 2 meters. It can be drilled and cut to form shapes, the colour pigment can be applied to the full size of the glass or just part of the glass and the edges are polished to show the colour neatly sandwiched between the glass panes. The interlayers are manufactured using heat and light-stable pigments, not dyes so the colour will not fade and as the colour is laminated between two sheets of glass, the product is easy to clean. Being laminated, it is also Grade A safety glass and by laminating several layers it can be used for coloured glass flooring or a well top.